An all-round India kept up the pressure on New Zealand with both bat and ball as they eased to a 2-0 lead in the five-match one-day international series. India's top five were all among the runs in posting 324/4 at the Bay Oval on Saturday, 26 January. Kuldeep Yadav was again the pick of the bowlers as they chipped away, preventing the hosts from building any kind of partnership. Doug Bracewell provided the pyrotechnics in a late 46-ball 57. Yet, New Zealand were bundled out for 234, conceding a 90-run victory. India's batsmen picked up where they left off in the first game. Rohit Sharma and Shikhar Dhawan chugged along at near six an over, to be 56 for no loss in the Powerplay. It wasn't that the bowlers didn't send down enough dot balls – the batsmen simply waited for the slightest chance to pick the gaps and expertly found the boundaries. Sharma's half-century came off 62 balls, and Dhawan's off 53. The first-wicket stand had burgeoned to 151 at the half-way stage when New Zealand finally got something to celebrate. Trent Boult drew a thick outside edge from Dhawan (66), which carried to a diving Tom Latham behind the stumps. Rohit (87), then, was denied a hundred, caught well in the deep after going for the pull against Lockie Ferguson. A couple of fours from Virat Kohli on either side of the square took India past 200 in the 35th over as the imperious batting show continued. He fell trying to accelerate and it was to the home bowlers' credit that they pulled things back. They took pace off the ball and the boundaries dried up for a short while, even as the impressive Ish Sodhi finished with 0/43. Mahendra Singh Dhoni has in recent times been criticised for his slow rate of scoring. On Saturday, however, he had no such issues. He struck one six and five fours in his 33-ball 48*. With Kedar Jadhav pitching in with 22* off 10, the duo put together a brisk fifty-run stand, including 21 off the last over. New Zealand's batsmen weren't afraid to swing their bats, and there were a few entertaining cameos. But the fearlessness deserted them when it came to playing spin. Where strong partnerships were required to chase down a considerable target, they could offer none. A combined batting effort powers India to 324/4 at the Bay Oval. Can New Zealand chase it down and level the series? Martin Guptill lived dangerously before becoming the first wicket to fall, caught in the deep off Mohammed Shami. Kane Williamson swatted short balls from the same bowler for two sixes before perishing chopping on to his stumps. The spinners then did the rest. 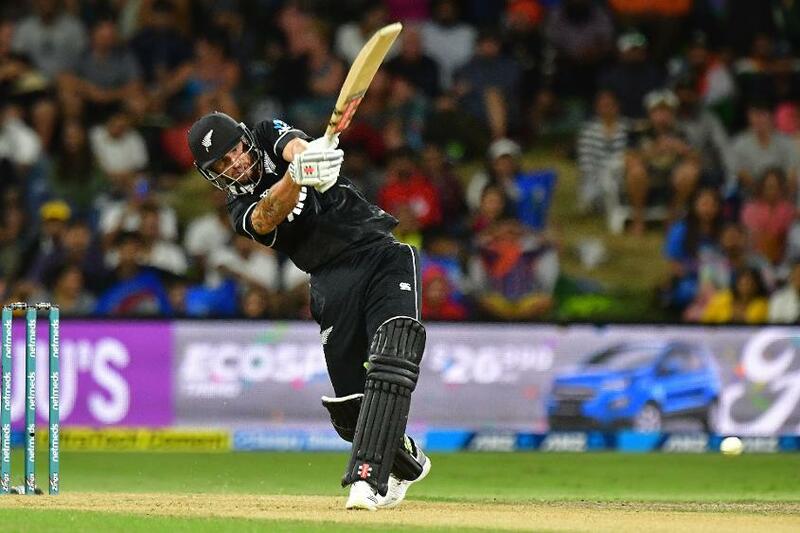 Yuzvendra Chahal nipped a promising start by Colin Munro, while part-timer Kedar Jadhav combined with the quick hands of Dhoni to have Ross Taylor stumped. The drift seemed to have thrown Taylor off slightly, and his foot was in the air when the Indian wicket-keeper dislodged the bails. Yadav then ran through the middle order, including two wickets in two balls in the 31st over of the game, his variations and flight making the batsmen tentative. He would finish with 4/45. The eighth-wicket partnership of 58 between Ferguson and Bracewell was New Zealand's best, with Bracewell bringing up an attacking half-century, his first in international cricket. The lower-order resistance was entertaining, but only served to soften the margin of defeat.